We’re on the front cover… again! Hello everyone and happy St. George’s Day. It is a full spring-like day here at Chrysalis HQ, beautiful sunshine, mild weather, pretty bulb flowers gently swaying in the breeze against vivid green new grass. All this colour is enough to convert the most hardened neutral lover into designing a room full of bright hues! Well today is a good day to update you all on the news here. In one of my last posts I promised you a peek into my new home which we have modified considerably from its “off-the-shelf” beginnings and decorated most of it in lovely shades of grey. Well, it is now almost finished and I uploaded some photos into my portfolio under the heading Hermosa Casa Gris, which means “Beautiful Grey House” in Spanish. I will upload more photos as the house and garden is finished off. In the meantime, your comments and opinions on the work so far would be greatly appreciated. Secondly, if you live anywhere in the Midlands of the UK – from Shropshire in the west to Leicestershire in the East; from North Staffordshire to Warwickshire and the Cotswolds in the south – then find yourself a copy of the lovely seasonal glossy magazine, Midlands of Today and guess what you’ll see on the cover…? Yes you guessed it, it’s us! This is our second magazine cover this year and we are very excited about this one. The spring issue of Midlands of Today is graced with one of our favourite pictures from the portfolio Boho Blanc Bedroom and it looks fantastic. 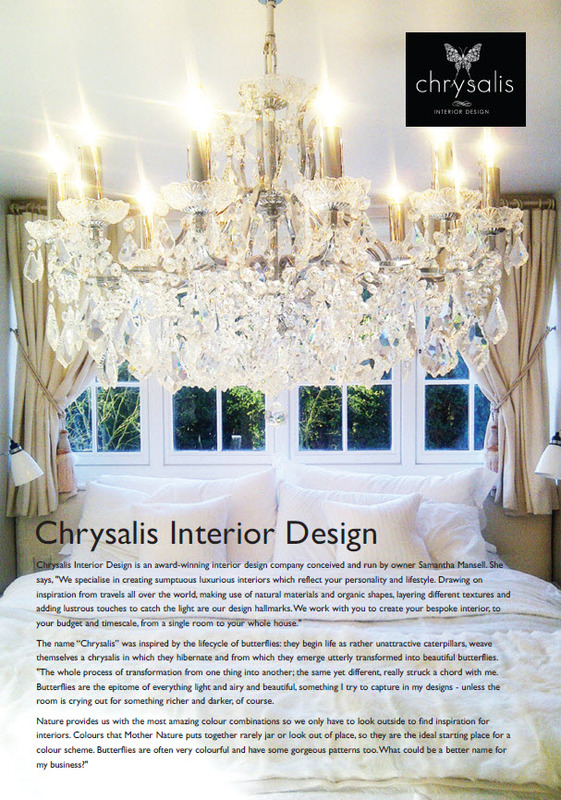 Inside, we are listed on the contents page and have a mention in the Editor’s note. 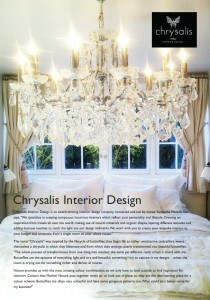 Then on page 19 there is a 3 page spread all about Chrysalis Interior Design, and it really looks amazing. We are very grateful to the lovely people over at Midlands of Today for their sterling work in making us look as good as possible. We are very proud of this article and cover story so please, go out there and get yourself a copy of the magazine and see it for yourself! In the meantime we have some exciting new projects in the works which will gradually make their way onto this website and into the portfolio as they get finished. But please do remember, we don’t just deal in decorating whole rooms or houses from scratch, we also do product sourcing, soft furnishings and room refreshing. So for all of your home renovation needs, even if you just need to find the perfect wallpaper for one wall, please think of us! We’d be so happy to meet you and help you out.